Shorty Lungkata Tjungurrayi joined the Western desert movement in 1972. He was not one of the founding members but the bold visual simplicity of his artistic compositions conveyed an elemental power that rapidly made him an important member. 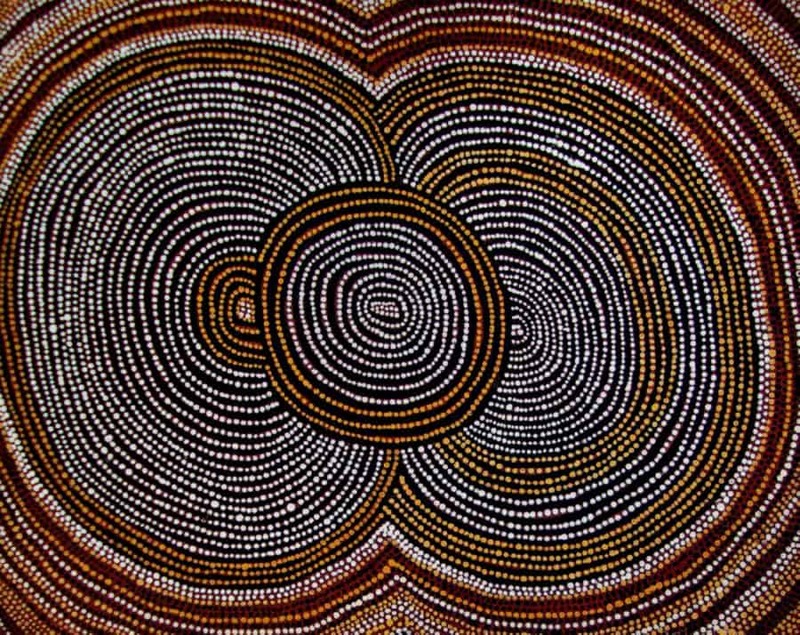 Shorty Lungkata Tjungurrayi greatest works were created when the market demand for Western Desert art was very limited. Lungkata’s significance as an artist should not be underestimated by the relative scarcity of his work. Many of his early works are intense small and painted on board. They contain ritual and secret imagery meant only for the eyes of initiated men. The aim of this article is to assist readers in identifying if their Aboriginal painting is by Shorty Lungkata Tjungurrayi. It compares examples of his work. It also gives some background to the life of this fascinating artist. 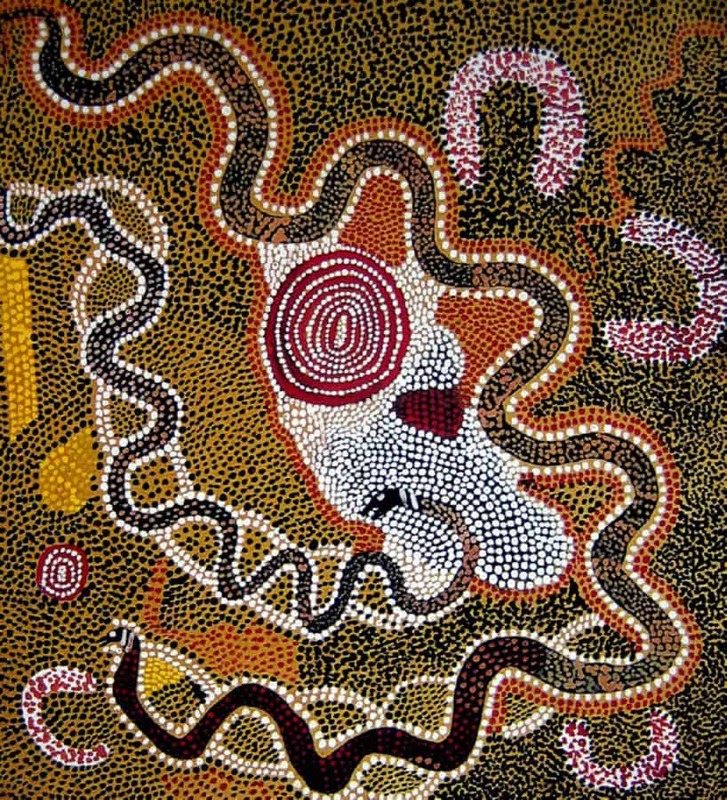 If you have a Shorty Lungkata Tjungurrayi Aboriginal painting to sell please contact me. If you want to know what your Shorty Lungkada Tjungurrayi painting is worth please feel free to send me a Jpeg. I would love to see it. Shorty Lungkata Tjungurrayi was born in Walukuritji around 1920. He lived a traditional nomadic hunter-gather lifestyle until his 30’s when he moved to Hassts Bluff. He was already fully initiated and a respected witch doctor Ngankari. Shorty Lungkada was also a renowned hunter, dancer and respected tribal leader of the Pintupi people. His main experience with white people came when he took a small group of documentary makers to his homelands. He acted as a guide but spoke little English and relied on a translator. In 1960 he moved over the MacDonnell Ranges to the new settlement at Papunya. At Papunya, the Pintupi were marginalized, and there were ongoing conflicts between the people of various language groups clustered around the settlement. Lungkata was a forceful advocate for his people and more than once would proclaim his rights in a dance with spears in front of a large crowd. Due to the dire living conditions, he and his family later chose to live on outstations to the west of Papunya settlement. In 1971 Geoff Bardon became a local school teacher at Papunya primary. He tried to encourage local children to paint in their own traditional style. When he learned only older men could paint these stories he started a men’s painting group. Lungkarda didn’t begin to paint until the beginning of 1972. The painting group had already been active but he was welcomed into the group due to his senior status. He was welcomed by his Pintupi clansmen Charlie, Uta Uta and Yala Yala. His early paintings are simply structured but concentrated and intense. He did not rush sections like some artists but poured his soul into every part of his art. These early pieces by Shorty are in my opinion some of Aboriginal Australia’s most captivating and finest works. The bold visual simplicity of his artistic compositions conveys an elemental power. 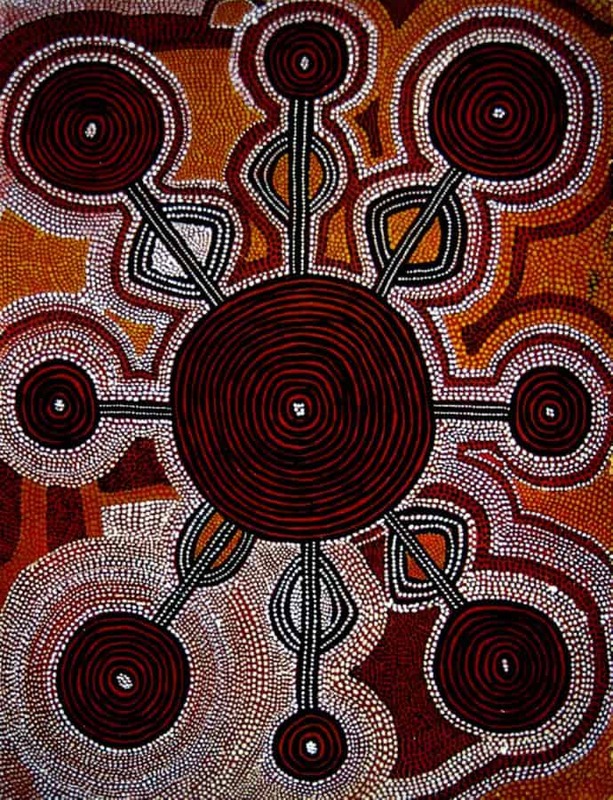 He became one of a select group with Tim Leura, Yala Yala Kaapa and Billy Stockman who were granted a government allowance that enabled them to paint full time. Geoff Bardon recalls Shorty Lungkada worked ‘impervious to disturbance’, and with seriousness intention, animating each dot. Women’s dreaming, 1972, is a magnificent example of his earliest work. It is spare and powerful, but with subtle details such as the interlocking of the dotted white lines that ensure the eye cannot rest completely on the imposing red ochre ‘U’ shapes representing the two women. Despite its pared back simplicity, this work resonates with the power of song – it is a moment of ephemeral ceremony enduring miraculously on hardboard. By the mid-1970’s Shorty Lungkada was living in outstations west of Papunya. His art became increasingly elaborate. His paintings often featured multiple sets of looping crescents building from a steady center. In some instances, he employed subtle modulations of tone and color to support the pulsing rhythm of a work. He often overlapped concentric circles and made them appear to collide or lay on top of each other. 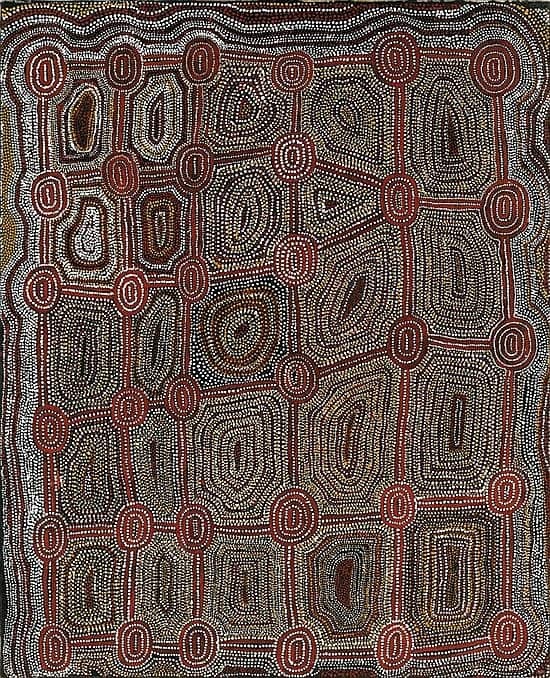 During this phase, he was the only Papunya Tula artist to begin his roundels with ovals rather than circles, giving his painting an attenuated, slightly convex feel. 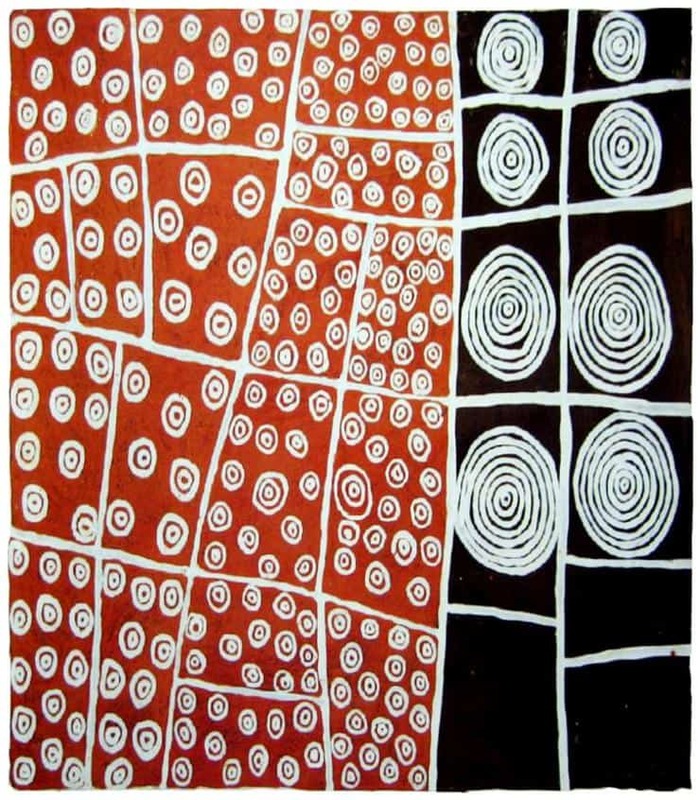 Most of these middle phase paintings relate directly to the Tingari Cycle and his ceremonial knowledge and tribal seniority played an instrumental role in consolidating the ‘classic’ Pintupi style. Tingari is the most important teaching myth, used to initiate the younger generations by revealing their social identity and spiritual inheritance. By the end of the decade, he was creating monumental, authoritative works that were comprehensive representations of the several Tjukurrpa that cross his traditional country. In the early 1980’s Lungkata moved from Papunya to help and set up the outstations of Kintore and then Kiwirrkura. He was an assertive leader in the ‘outstation movement’. His tribal name Lungkata also has various spellings including Lungkarta Tjungurrayi, Lungkarda Tjungurrayi or Lungkada Tjungurrayi.